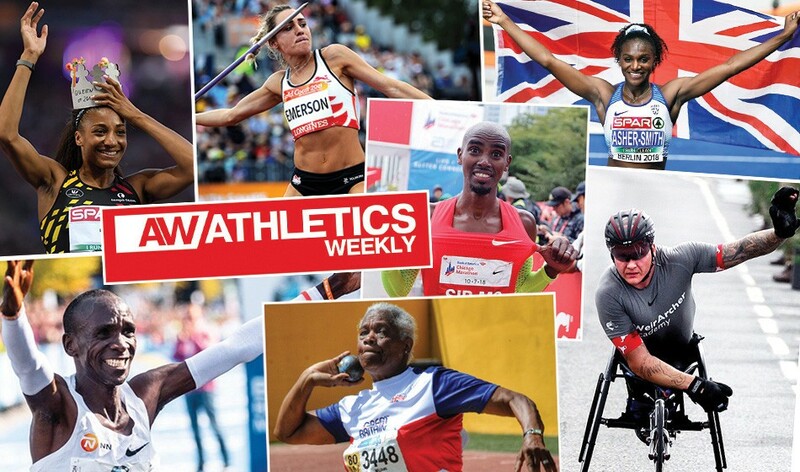 While many end-of-year honours are picked by panels of experts, for the Athletics Weekly athletes of the year awards those experts are you – our readers and fans. There are 10 categories covering the leading British and international athletes, plus sections for under-20 and masters performers. These accolades are ultimately just a bit of fun and there is no real hardware to be presented when the winners are decided, but what better honour could there be than knowing you have impressed the most knowledgeable athletics readership in the world? Voting closes on December 12 with the results published in the December 20 edition of the magazine. Christian Coleman: The American broke the world indoor 60m record and won the world indoor title, ran a 100m world lead of 9.79 and claimed the IAAF Diamond League title. Armand Duplantis: Still just 18, the Swedish pole vaulter became world under-20 and European champion with a world-leading height and set eight world U20 records, indoors and out. Jakob Ingebrigtsen: Aged 17, the Norwegian talent won European 1500m and 5000m titles and broke European under-20 records in the 1500m, mile and 5000m. from the previous global mark, and also won the London Marathon. Kevin Mayer: The French multi-eventer bounced back after his European Championships disappointment to break the world decathlon record with 9126 points and also won the world indoor heptathlon title. Abderrahman Samba: Clocked the world’s quickest 400m hurdles time since 1992 with 46.98 and was unbeaten in nine finals, with the Qatari also winning at the Asian Games and Continental Cup. Sergey Shubenkov: The Russian won the IAAF Diamond League 110m hurdles title and went sub-13 seconds four times, clocking a world lead of 12.92. Also won the Continental Cup. Tom Walsh: The New Zealand shot putter achieved the longest throw since 2003 with 22.67m and became world indoor, Commonwealth and IAAF Diamond League champion. Dina Asher-Smith: British sprinter not only won European titles at 100m, 200m and 4x100m but she tops the world rankings in those events. Beatrice Chepkoech: Kenyan smashed the world 3000m steeplechase record by eight seconds and won the Diamond League final, IAAF Continental Cup and African title as well as Commonwealth 1500m silver. Caterine Ibarguen: Unbeaten in the triple jump, the Colombian took Diamond League and IAAF Continental Cup victories in not only her specialist event but also the long jump. Mariya Lasitskene: Only beaten once in 26 high jump competitions as the Russian took world indoor, European, Diamond League and IAAF Continental Cup wins. Shaunae Miller-Uibo: Unbeaten all year, the Bahamian won Commonwealth and Diamond League 200m crowns and clocked the fastest 400m in the world for 12 years. Sandra Perkovic: Croatian discus thrower took her fifth consecutive European title as she dominated her event with the top seven throws in the world this year. Caster Semenya: Unbeaten at 800m as she won Commonwealth, IAAF Continental Cup and Diamond League titles, the South African also took Commonwealth 1500m and African 400m golds. Nafissatou Thiam: The Belgian heptathlete beat Katarina Johnson-Thompson to the European title with a world lead of 6816, while also ranking No.3 in the world at high jump with 2.01m. Tom Bosworth: Improved his UK 20km race walk record to 79:38 to win Commonwealth silver and also set a world indoor 3000m best and British indoor 5000m record. Tim Duckworth: Won NCAA titles in both the decathlon and heptathlon, breaking the British heptathlon record with 6188 points and moving to third on the UK decathlon all-time list with 8336 points. Won the UK long jump title and finished fifth in the European decathlon. Mo Farah: Won the Chicago Marathon in a European record of 2:05:11 and earlier in the year finished third in the London Marathon in a then UK record of 2:06:21. Also won all four of his other road races at 10km and half-marathon. Zharnel Hughes: Claimed European 100m and 4x100m titles, plus gold in the Commonwealth 4x100m. Finished first in the Commonwealth 200m but was later disqualified. Ran a UK-leading 9.91 to go joint second on the British all-time list. British title and was third in the Diamond League. Nick Miller: Won the Commonwealth hammer title with a UK record of 80.26m and was ranked third on the world list. Won the British title. Andrew Pozzi: Became world indoor 60m hurdles champion after clocking 7.46 and also recorded a UK-leading time in the 110m hurdles with 13.28. Won UK titles both indoors and out. Reece Prescod: Moved to fourth on the UK all-time list with 9.94 for the second-fastest UK time of the year, plus a windy 9.88. Also won the UK title and at the Diamond League in Shanghai as well as European silver. Dina Asher-Smith: Won European 100m, 200m and 4x100m titles, setting world- leading UK records in the individual events of 10.85 and 21.89. Claimed Commonwealth relay gold and 200m bronze and finished second in the Diamond League 100m. Holly Bradshaw: Claimed European pole vault bronze and finished fourth at the Commonwealth Games and Diamond League. Won the British title and cleared a UK lead of 4.80m. Katarina Johnson-Thompson: Won world indoor pentathlon and Commonwealth heptathlon titles as well as European heptathlon silver, with her mark of 6759 points placing her second in the world rankings. Eilish McColgan: Claimed European 5000m silver and clocked a UK-leading 14:52.83. Also had the top UK road 10km time of 31:53 and won the Great South Run on her race debut at a distance over 10km. Laura Muir: Won the European 1500m title and also claimed world indoor medals at 1500m and 3000m. Ran UK leads in the 800m, 1500m, mile and indoor 3000m and won the Diamond League 1500m plus UK 800m title. Shara Proctor: Bagged long jump bronze at both the Commonwealth Games and Europeans, finished second in the Diamond League and ranked second in the UK with 6.91m. Lorraine Ugen: Long jumper leapt a world- leading 7.05m and won the UK title. Finished fourth at the Commonwealth Games and anchored the 4x100m team to victory. Laura Weightman: Claimed European 1500m bronze and Commonwealth 5000m bronze. Ran the second-quickest UK time of the year in the 1500m and won the British title. Aled Davies: Gained European gold in the shot put in Berlin despite his leg brace breaking in warm-up and also won the discus title for his third successive double gold at these championships. David Devine: The Liverpool Harriers athlete has bounced back from illness and injury to take WPA European 5000m gold this year in the T12 category as well as 1500m silver. Simon Lawson: Close third behind England team-mate JohnBoy Smith in the T54 marathon at the Commonwealth Games in April. Nathan Maguire: Wheelchair racer took European medals in the T54 100m, 200m, 800m and also the universal relay in Berlin, including a gold medal in the latter. Zak Skinner: Silver in the T13 long jump at the European Championships but the Tonbridge athlete was only 5cm behind winner, Ivan Blanco of Spain. JohnBoy Smith: Silver in the Commonwealth Games T54 marathon behind Australian Kurt Fearnley and runner-up in the Great North Run to David Weir. David Weir: Won a record eighth London Marathon wheelchair racing title, in addition to victories in the Westminster Mile, Great Manchester 10km, London 10,000 and also the Simplyhealth Great North Run. Thomas Young: Only 18, the T38 sprinter from Charnwood AC is a relative newcomer to athletics but won European 100m and 200m gold in Berlin. Kare Adenegan: The teenage wheelchair racer broke the T34 100m world record at the London Anniversary Games, beating five-time Paralympic champion and previous record-holder Hannah Cockroft. Also won European 100m gold and 800m silver. Hollie Arnold: Won Commonwealth and European F46 javelin titles, also breaking her own world record with 44.43m. Olivia Breen: Won the Commonwealth T38 long jump title and 100m bronze plus bronze at the European Championships. Hannah Cockroft: Won the European T34 800m title and claimed silver in the 100m behind Kare Adenegan. Sabrina Fortune: Ended the season as world No.1 in the F20 shot put with a best of 13.70m and claimed the European title. Sophie Hahn: Improved her T38 200m world record to 25.93 and achieved Commonwealth gold in the T38 100m and three European titles in the 100m, 200m and universal relay. Jade Jones-Hall: Claimed the Commonwealth T54 marathon bronze and also won paratriathlon gold at the same Games. Maria Lyle: Claimed Commonwealth T35 100m silver and won the European title in the same event. Sam Bennett: Sprint hurdles gold in Györ in a European Under-18 Championships record of 13.19, while the Basildon athlete also won English Schools gold. Max Burgin: Set a world age 15 best of 1:47.50 for 800m in Manchester just eight days before his 16th birthday and later took the European under-18 title in a UK age-group record of 1:47.36. Charlie Dobson: Only five hundredths of a second behind GB team-mate Jona Efoloko in the world under-20 200m final in Tampere as he took silver. His 20.53 places him No.5 on the UK all-time junior rankings. Jona Efoloko: Sale sprinter went No.4 on the UK all-time 200m rankings for junior men when he clocked 20.48 to win the world under-20 title in Tampere, while the time also makes him No.8 on the UK senior rankings in 2018. Jake Heyward: Fourth in a world under-20 1500m final won by George Manangoi from Jakob Ingebrigtsen. His 3:36.90 puts him No.2 on the UK all-time junior rankings, while his 7:55.17 for 3000m is No.3 all-time in the UK juniors. Thomas Keen: Another athlete to complete a European Under-18 and English Schools double, this time at 3000m, plus minor medals in the English Schools, National and Inter-Counties on the country. Jake Norris: World under-20 gold with a UK junior record of 80.65m with the 6kg hammer, while his best with the senior hammer of 73.24m is also a UK junior record. Dominic Ogbechie: The multi-talented teenager set a world age 15 indoor best of 2.22m and later, aged 16, won the European under-18 high jump title in Györ, while he took English Schools 200m gold and England Athletics long jump victory. Kristal Awuah: The Herne Hill Harrier won two bronzes in the World Under-20 Championships in the 100m and the 4x100m. However, her most impressive run was a late season 11.16 in winning the Berlin ISTAF B race which put her close second in the UK all-time under-20 lists to Dina Asher-Smith’s 11.14. Molly Caudery: Finished a fine fifth in the Commonwealth Games and cleared a British junior record of 4.53m in Mannheim, which would have sufficed for gold at the World Under-20 Championships, where she finished ninth. a 2:09.74 800m to secure gold. Her 6253 score missed Katarina Johnson-Thompson’s UK junior record by just 14 points. She also won Commonwealth senior bronze on the Gold Coast. Keely Hodgkinson: The Leigh athlete won European under-18 gold at 800m by over a second and ran inside 2:05 four times with a best of 2:04.26. She won the under-20 800m championships against older athletes and had top six placings in the National, English Schools, Inter-Counties, Northern and Schools International cross-countries. Ella McNiven: The Liverpool Harrier had a good cross-country season, winning the under-17 National, English Schools and Schools International. Her track season did not reach the heights of 2017 but she won the English Schools, Schools International and School Games 3000m. Jessica Lewis: Won the English Schools junior girls javelin title in a championship record 43.30m. Bea Wood: The Wiltshire runner won the English Schools double at cross-country and 1500m. In the latter in winning the junior girls title, she remarkably ran faster than the senior and inter winners. Emily Williams: Won a 1500m silver in the European Under-18 Championships and also won the English Schools inter girls 1500m against a quality field. Dominic Bradley: Won three M40 golds at the World Masters Championships with an 11.08/22.72 individual double and picked up a 4x100m title, too. Jason Carty: Won a world M45 sprint double, taking the 100m in a UK record 11.01 and also dropped down an age group to share in the M40 4x100m victory. Mark Johnson: 27 years after he set his 5.26m pole vault PB, he took a share of M50 World Masters gold and also won silver in the European Masters Indoors. Steve Peters: Continued his dominance of vets sprinting with an M65 World Masters triple at 100m, 200m and 400m. Set UK records in Malaga at 200m in 24.84 and 400m in 59.09. Unbeaten in his own age group. Mark Symes: After a fourth in the World Masters M45 800m, he returned to win an exciting 1500m. Set lifetime bests in both events in the heats and also won a British Masters double. Ian Richards: 1980 Olympic 50km walker won the World Masters M70 5000m, 10km and 20km events and also won a European Masters non-stadia double at 10km and 30km. He also set British masters M70 track records at 3000m and 5000m. Jonathan Tilt: Achieved a 54.71/59.80 400m and 400m hurdles M55 double at the World Masters. The latter was a British record. He was second in the European Masters Indoors at 400m. John Watts: 1972 Olympic discus thrower won World Masters M75 gold despite being in his final year in the age group. He also won bronze in the weight and won silver at the European Masters Indoors discus outdoor throw. Alison Bourgeois: Won a World Masters W65 double at 800m and 1500m, as well as European Masters 800m gold and 1500m silver. Also set a UK W65 record at 800m of 2:42.18. Angela Copson: Won six individual W70 golds at the World Masters Championships at Malaga – 400m, 800m, 1500m, 5000m, 10km and cross- country. She also won European Masters indoor titles at 800m, 1500m, 3000m and cross-country and a European Masters non-stadia 10km and half-marathon double. In addition she set world indoor records at 800m, 1500m and 3000m. Jane Horder: Won World Masters hurdles double gold at 80m and 300m in Malaga and also won the 60m hurdles gold in the European Masters. Virginia Mitchell: The Guildford and Godalming athlete won the 400m and 800m double at the World Masters Championships and European Masters Indoors. Susie McLoughlin: Won the W40 400m World Masters gold in 57.79 and came was second at 200m and third at 100m. Indoors she won European Masters golds at 200m and 400m. Also set a British W40 200m record of 25.56. Jo Pavey: A quiet year but, at the age of 44, she did win the BMC Loughborough 5000m in 15:48.84. Caroline Powell: Continued her W60 400m dominance with a golden double at the World Masters and European Masters Indoors. She also won medals in the two events at 60m, 100m and 200m. Evaun Williams: The W80 won World Masters shot, hammer, javelin and pentathlon weight golds, setting world records in each. Also second in the discus.